Hire chariot displays, they are great, they are something many guests will only have seen on television. We have a few options for the chariot displays the shows and the chariot racing, guests love nothing more than seeing the horses and chariots hurtling down the course at break-neck speed. ”Hire chariot displays”, with the chariot drivers in full regalia and it is like being at the Coliseum watching the gladiators. We hire gladiator displays to a wide range of client from shows at racecourses, displays at company fun days and for props for television companies. Hire chariot displays, great arena displays. We cover the whole of the UK and seeing these traditional Roman and Greek attractions in real-life is great for the children and the adults. 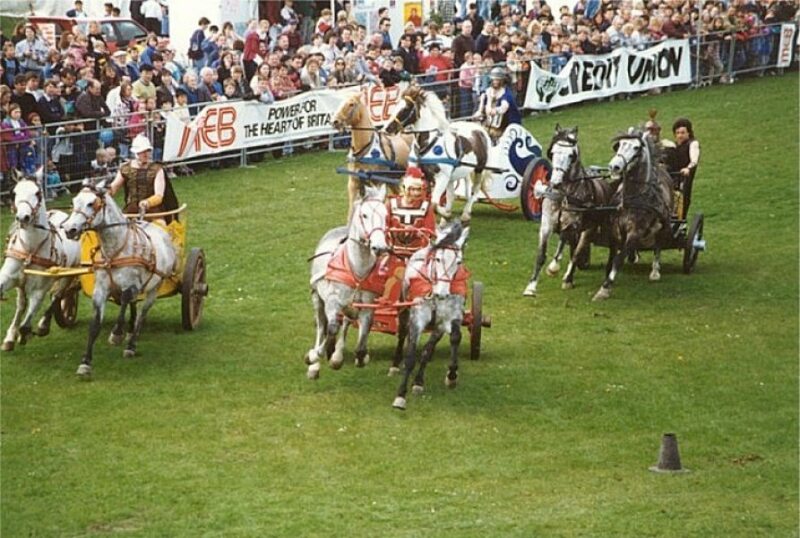 We have a wide range of animal attractions for arena shows but when you hire chariot racing you get one of the best acts available. The guests all love the sense of occasion, the sight of the horses and chariots being expertly controlled and the thrill of the race. The chariot arena acts are some of the most action packed shows we have available. The chariot arena displays are great, they really get the crowd going, cheering on their favourite chariot. Our chariot arena shows are available throughout the UK and are great for live audiences. We hire chariot arena acts as they offer something for the whole audience from the horse lovers to the adrenaline of the races. When you hire chariot arena displays and hire chariot arena shows you get a full commentary and get a feel for what the Roman chariot shows were all about. We hire chariot shows as great arena attractions. Hire chariot displays, we have all the arena acts you can imagine and can supply all the other activities from the fairground rides to the fun inflatable games, we will be able to organise your whole event and have something every guest will enjoy. The chariot displays are great, they will do a number of shows throughout the day and can keep large numbers of guests occupied at any one time. As a well-established entertainment agency we will have the perfect act for your event, call our experienced fun sales team for great ideas. Hire chariot displays, they are the best arena displays and great fun.